Today we are going to talk about Telenor Device Packages including the packages of Telenor 3G devices and Telenor 4G devices. Telenor is one of the top network providers in Pakistan that is providing mobile internet services over all the three 2G, 3G and 4G bandwidths. Telenor Group is an international telecommunications company that is headquartered in Norway. As of fourth quarter of last year, the company claims over 39.428 million mobile subscriptions and has about 6000 employees. Previously we discussed Telenor Call Packages, Telenor 3G/4G Internet Packages and Telenor Internet Settings. Let’s take a look at Telenor 3G/4G Device Packages. Telenor device packages include a diverse range of 3G and 4G dongles and devices at different prices. Telenor brings you the best internet experience with its technologically advanced Dongles. You can choose from three different Telenor internet devices with different packages. You need to get registered on the biometric device using your thumb impression to activate your Data SIM. Telenor USB Dongles provide flexibility, value for money and the assurance of no hidden charges. All Telenor devices have a 1-year warranty. In order to claim your warranty, visit the nearest Franchise, or call 345. 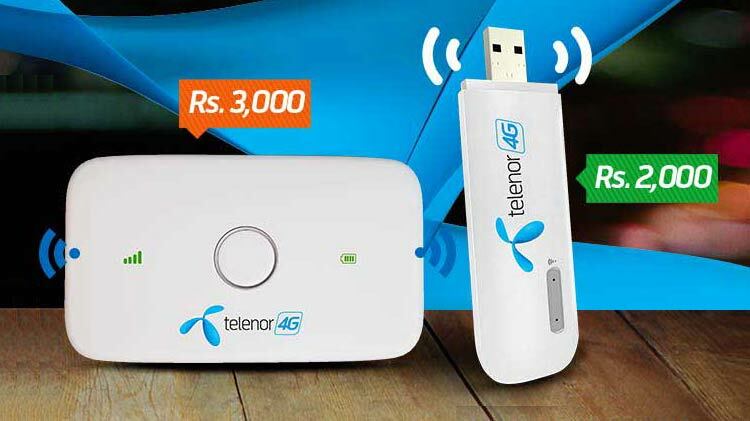 Telenor USB Connect and Telenor USB Connect Devices can be bought from Telenor Service centers, franchises and selective Retailers in cities with 3G coverage is available. 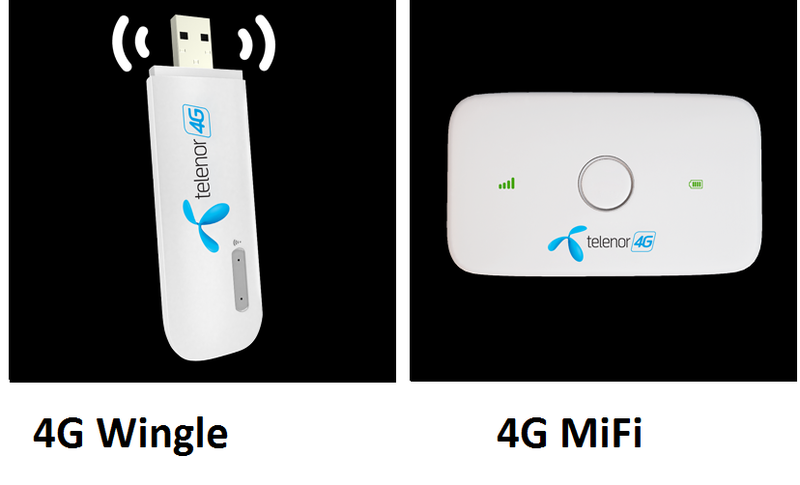 Telenor Dongle and Wingle Devices with 3G internet come with up to 30GB of data limit per month. These devices come with a free trial of two months with up to 60GB of data limit. Telenor 3G Wifi Connect is a high-speed USB internet modem, providing you blazing speeds on the go; it can be used with laptops and even with your desktops. It gives you multiple 3G Connections to Telenor’s superior 3G network and supports speeds up to 21MBPS. You can Connect up to 10 devices. It is a plug and play device; which, as soon as it is connected to your machine it automatically installs the drivers, and starts working. You can use your existing Telenor SIM with the device after migrating it to a data package, which you can do so by dialing the USSD code *345*4006#. Once migrated, voice calls will be blocked on that SIM, so it is advisable to do the migration only if you have a spare Telenor SIM. Telenor 3G Mobile Wifi is a high-speed USB internet modem, providing you blazing speeds on the go; it can be used with laptops and even with your desktops. It gives you multiple 3G Connections to Telenor’s superior 3G network and supports speeds up to 21MBPS. You can connect up to 10 devices through Wifi at the same time. It has a six-hour battery backup to make it a truly mobile device. Free Trial: 2 months of free internet (20 GB/month). Telenor 3G Packages have been discontinued. How to reset 3G WiFi Password? In addition to 3G Telenor Device Packages, the cellular service provider also offers 4G Device Packages to its users. 4G Wingle is a network access terminal product that is connected with Laptop/PC or USB port and used to access internet on WiFi enabled devices (handsets, tablets, PC/laptop etc). You can get the ultimate internet experience satisfying all your data needs with Telenor’s fastest growing 4G 850 MHz network. 4G Wingle can support up to 10 multiple internet connections. With Telenor 4G MiFi, get the ultimate internet experience, both at home and on the go with the fastest growing and superior 4G network. With speeds up to 150 Mbps, you can satisfy all of you data needs with ease and convenience. 4G MiFi is a portable device with a rechargeable battery which connects up to 16 multiple connections. This was all about Telenor 3G/4G Device Packages. If we’ve missed anything, do let us know in the comments below. You can check our coverage of all call, SMS, and internet packages and internet settings of Telenor, Ufone, Zong, Jazz/Mobilink and Warid here.